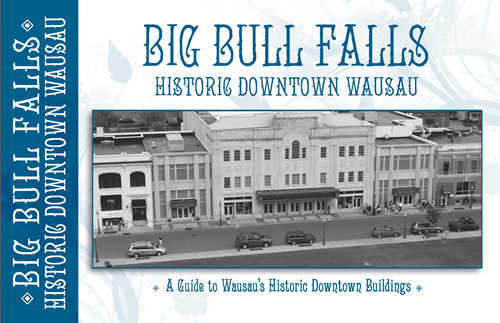 When George Stevens came to Big Bull Falls and settled on the east side of the Wisconsin River little did he know that the ground would grow into a city, and this city would come to be called downtown Wausau. And, that this downtown would continually bring together and hold the spiritual, civil, cultural, commercial, medical, educational, and residential life of the area to this day. It was the center of Wausau, from where all growth would spread to the south, to the north and across the rickety bridges to the west side. The downtown is still alive with evidences of that vibrant history. Through the years since George Stevens, the landscape of the downtown has changed. The population grew - the city expanded - change was inevitable. The biggest development was the building of the Wausau Center Mall in the early 1980s. A lot of the city went under the wrecking ball. Gone are the merchants, taverns, bowling alleys, restaurants, and auto dealers - replaced with an eight square block shopping center. While many buildings are now gone, many more historic buildings remain and continue to give Wausau a sense of character and place in Central Wisconsin. Enjoy the tour! When finished you will have witnessed the history and culture of downtown Wausau. This project was completely funded by a grant from the Wisconsin Historical Society and Wisconsin Public Television as part of the Wisconsin Hometown Stories: Wausau project.